For some hockey players, the pressure and the ample amount of distractions are too much to play professionally in their hometown. 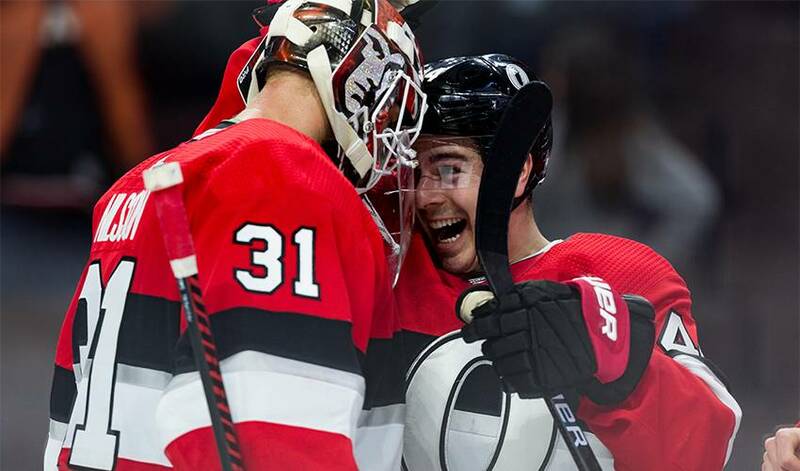 Ottawa Senators centre Jean-Gabriel Pageau, however, thrives on playing in front of family and friends on a nightly basis. The 26-year-old forward would not have it any other way, having been raised across the Ottawa River in Gatineau. “I love it,” he said. “It’s a city I grew up in and I love being around my family. My wife is from here. So are her parents. Pageau’s hockey world began in his neighbourhood at Parc St-Jean-Bosco’s outdoor rink. As he skated through and past his friends, he pretended to be Pavel Datsyuk of the Detroit Red Wings. Pageau dreamed of one day suiting up for the Gatineau Olympiques at the Robert Guertin Centre, a few blocks away. He realized that dream and his love affair with local hockey aficionados began. In the spring of 2011, Pageau dazzled the locals as the Olympiques upset Drummondville in the second round and Quebec City in the semifinals. He was magnificent, scoring 13 goals and 29 points in 24 games. Five of his goals were game-winners. Gatineau’s wonderful playoff run ended in the championship final, losing in six games to the eventual Memorial Cup champions, the mighty Saint John Sea Dogs. Pageau’s memorable performance was noticed by the Senators, however. They selected him a few weeks later in the fourth round (96th overall) in the 2011 NHL Draft. His playoff magic continued with the Senators at their rink in Kanata, Ont., a 28-kilometre drive from the Guertin Centre. In 2013, he became just the second Senators player to score a hat trick in the playoffs. Daniel Alfredson, a favourite of Pageau’s mom, Yda, was the first. The scene brought tears to the eyes of his father, Jean. As a fan of the old Quebec Nordiques, Jean hated the Habs. Pageau added to his playoff prowess in 2017, when he scored four goals in Game 2 of the second round against the New York Rangers, including the winner in double overtime. As he always does, Pageau worked hard last summer in preparation for this season. He was excited after he represented Canada at the World championship in Denmark last spring. His Uncle Paul was a goalie for Canada at the 1980 Olympics in Lake Placid, N.Y. But as he went through the Senators medical on the first day of training camp he tore his Achilles tendon during an agility test. He underwent surgery that day. His comeback included long days of physiotherapy, stretching, work in the pool, in the gym and later a return to the ice. Pageau wound up missing the first three months of the regular season before returning on Jan. 6. Of course, he scored in his first game back. “I heard the tendon snap,” he said. “I wanted to beat my score from the first time I took the test that day. That’s how competitive I am.